My name is Matt Jacobson and I’m a freelance sound designer in San Francisco. I double majored with a B.M. 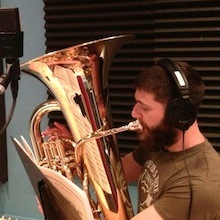 in tuba performance and sound design at Northwestern University. I graduated with Core and DSP certificates from Pyramind Studios in San Francisco, a wonderful sound design and production school. I absolutely love sound design, post production, foley, and layering sounds and music for games and picture. In my free time I love playing video games (currently working on Titanfall and Diablo III: Reaper of Souls), being a huge beer snob, playing the tuba, skiing, and conversing with fellow artists about what makes them tick. This Angry Bots level highlights the adaptive nature of layering music via means of aural intensity. In the video the listener will hear four separate layers of intensity that are entirely dependent to either the area or the proximity of a large robot. I used FMOD designer in tandem with Fabric’s timeline component: a multi-track component that allows layering and crossfading a number of sound layers together as well as linking the timeline and volume/pitch curves with game parameters. I set the game parameters to be spherical colliders emitting from the robots extending with varying ranges so that the trigger would be dependent on the proximity to a particular robot or an area – but it would never be the same proximity every time. In the case of multiple robots, the new layer would take over the soundscape entirely. This project was quite an undertaking of knowing enough of Unity’s design base without actually having skills as a game designer. I had to play with code and game design entirely unfamiliar to me at first. I’ve gained a fair amount of perspective from both game designers and programmers. This strongly influences the way I do my sound design and asset implementation. This project was also a fun way to learn about layering levels of aural intensity using FMOD designer and Fabric. I also learned a great deal about the difference between adaptive and interactive music, and how sounds deeply influence the quality of gameplay; we often hear something before we see it, and that should be no different in games. Oh, and playing very loud notes on the tuba and trombone for the samples were quite fun too!